Open innovation in entrepreneurships already finds its acceptance at all levels of the business industry for adding value to the business. The value could be in the form of economic gain or enhancement of knowledge leading to a sustained financial base. Open innovation adopts various strategies to accomplish the task for enhancing the value gain. Varying by size, nature, pattern, or characteristics of the firm various strategies are being adopted by enterprises. Though largely known to be familiar in corporate business houses, in recent years open innovation is also becoming increasingly familiar in small and medium enterprises (SMEs) and the trend is rapidly increasing. However, despite the potency of open innovation strategies, most of the enterprises are yet to find a sustained business model, especially for the SMEs working at the periphery of that value chain. This forms the basis of the current study. This chapter is trying to formulate a business model incorporating partnership approach from academia, research houses, intermediaries, and other stakeholders. Innovation can be termed as the outcome of a set of activities that utilizes knowledge to create new value to those benefiting from its use (De Sousa, 2006). It is clear that successful innovation under complexity, uncertainty and transformation can only be achieved through collaborative approaches that integrate knowledge inside and outside the enterprise. This model, in turn more popularly known as open innovation business model, is being increasingly used by enterprises throughout the world. 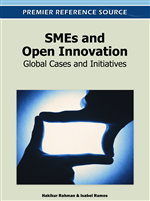 It has been observed that this format of open innovation business model is a must for SMEs, which usually lack knowledge of competiveness to fully comply with the innovation process. It has also been observed that larger organizations are increasingly moving away from their traditional R&D approach to a more collaborative approach, varying in nature and context (De Sousa, 2008).